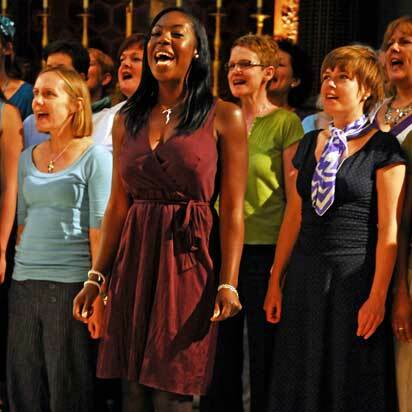 Our aim, each time a choir rehearses or performs, is that every singer leaves feeling uplifted, energised and wanting more. Vocality choirs and workshops are open to anyone who loves to sing. There are no auditions and you don't need to read sheet music - we don't use it! Our choirs learn all songs and harmonies together by ear and repetition, guided by our experienced choir leaders. Vocality attracts an interesting mix of people who share a love of singing and are prepared to have fun with it. Our members are often to be found socialising after rehearsals or performances. Newcomers commonly tell us how welcome they are made to feel. We develop a feel for songs as we go along and, because all eyes are focused on the conductor rather than sheet music, we are free to experiment with the sound as the mood takes us. Songs are polished as we prepare for performance, and whilst we aim high we don't sacrifice enjoyment for perfection. Learning a complex harmony or tricky lyrics can be a challenge but we’re all in it together and we always get there in the end! As a matter of course we provide members with CDs or downloads of all song parts and words so that they can practise at home if they wish.